Munich, 24 January 2019: FC Bayern was one of the first Audi partners to test drive the new Audi e-tron at Munich Airport, when the team bus was replaced by the electric car in an experiential event. Players, coaches and board members from the German football club got a chance to experience the electric SUV for themselves. Audi has had a close partnership with FC Bayern since 2002, and the German record-breaking footballers took time out of their Bundesliga schedule to meet the luxury car manufacturer. Audi's first fully electric series model will be launched in the European market over the coming weeks. 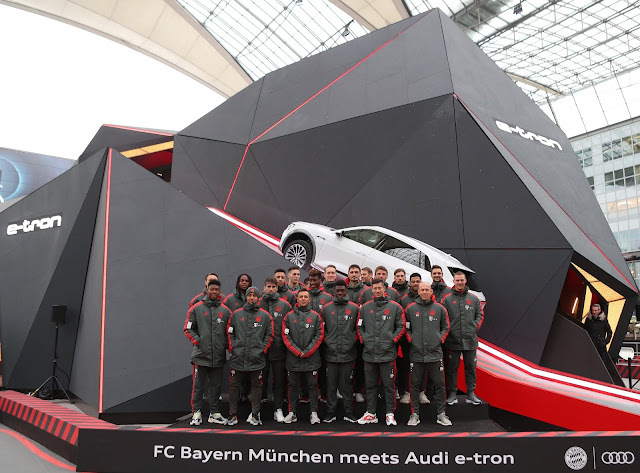 The event 'FC Bayern meets Audi e-tron' took place in the multi-storey Audi e-tron Meteorit located at Munich Airport in the grounds between Terminals 1 and 2. The players took part in various e-tron- themed activities and showed off their skills by taking part in an e-scooter obstacle course and a remote-controlled e-tron model car competition. They also undertook driver training in e-tron vehicles at the Audi Training Center at Munich Airport. The Audi e-tron Meteorit will remain open to visitors until mid-March and car enthusiasts can test drive the Audi e-tron on-site without making an appointment in advance. A free one-hour test drive may be reserved in advance through Audi’s partners.